The purpose of this blog is to connect robotics to industry. However, as a physical therapist, I have to say I am personally vested in the amazing products that have been developed for rehabilitation in the past few years. The ReWalk is another great product that allows for the mobility of those who are otherwise wheelchair bound. 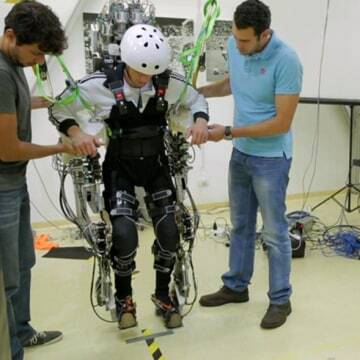 A bionic exoskeleton with forearm crutches allows those with lower body impairments to stand, walk, and see others ‘face to face,’ as their website points out. Additionally, ReWalk also allows for clients to participate in exercise that is otherwise unfeasible due to their physical limitations. Their models are available at a number of rehabilitation centers throughout the US, Europe, and Israel. Update: The ReWalk has now been cleared by the FDA for personal use outside of rehabilitation centers.